Robert Willis Hellwarth is George Pfleger Professor of Electrical Engineering and Physics at the University of Southern California (1970-present). Other institutional affiliations include Hughes Research Laboratories and the California Institute of Technology. His research interests include quantum electronics and the Raman Effect. December 10, 1930Birth, Ann Arbor (Mich.). 1952Obtained BSE, Princeton University, Princeton (N.J.). 1955Obtained DPhil in Physics, Oxford University, Oxford (England). 1955 – 1965Lecturer, California Institute of Technology, Pasadena (Calif.). 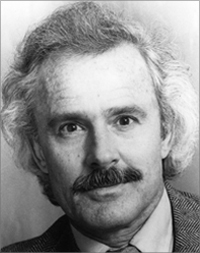 1955 – 1970Member, Technical Staff (1955-1965); Senior Staff Physicist (1965-1970); and Manager, Theoretical Studies Department (1968-1970), Hughes Research Laboratories, Malibu (Calif.). 1966 – 1970Senior Research Fellow, California Institute of Technology, Pasadena (Calif.). 1970 – presentGeorge Pfleger Professor of Electrical Engineering and Physics, University of Southern California, Los Angeles (Calif.). Lecturer and Senior Research Fellow. Member, Technical Staff; Senior Staff Physicist; and Manager. George Pfleger Professor of Electrical Engineering. Correspondence and reports regarding the early history of the laser research program at the Lawrence Radiation Laboratory, 1962-1972. Oral history interview with Robert Willis Hellwarth, 1983 May 19. Letter from Arthur Leonard Schawlow concerning Maiman's testimony during the Hellwarth vs Gould patent proceedings and the rejection of one of Maiman's manuscripts on masers by Physical Review Letters; and a copy of Maiman's testimony in which he discusses his work in developing ruby lasers, 1959-1984. Oral history interview with Fred J. McClung, 1985 March 6. Oral history interview with George Foster Smith, 1985 February 5.